There is always one thing that you can count on from NetEnt, top-quality online slots that offer something thatis different from the bog standard slots that many other casino game developers create. Secrets of Atlantis is another of those slots and what you can expect from this online slot, are fantastic visuals, ultra-smooth animations and some fantastic bonus features such as the Colossal Symbols Respin feature. Secrets of Atlantis has 5-reels and 40-paylines, a return-to-player percentage of 97.10% and has a medium variance that should ensure plenty of action on the reels. We have no idea whether the lost city of Atlantis even exists (does anyone?) but with a jackpot of 400x your total win bet on offer, we don’t really care and we bet most of you do not either. 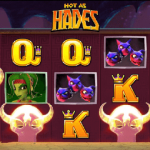 Want to know more about this excellent online slot from NetEnt? Then carry on reading and be prepared to be amazed at the quality online gambling experience that it can provide. In true Net Entertainment style, Secrets of Atlantis really is something to behold in a graphical sense. Themed around that mythical lost city of Atlantis, the action takes place underwater at the supposed location of where this to-this-day hidden city. Among the deep-blue depths, you will see the city in the background, the games logo in the top right of the screen, the games controls at the bottom and of course, the reels are centre stage in the middle. These reels are transparent which allows you to take in the fantastic background and on them, you will find symbols such as low-paying symbols like the red, green and blue gems and more valuable symbols such as the pearl in a shell, crabs, turtles and jellyfish. As for the games special bonus symbols, there is just one and that is the stacked mermaid symbol. You will learn more about what that wild can do shortly but what we will tell you now is that it can lead to some excellent wins on your reels. If you want to know how much each of the symbols can be worth to you should you land them in a winning combination, head over to the games pay table. This will not only show you the potential payouts you can get but will also explain in more detail the two main game features that this online slot has. Once you have decided that you want to give this game a go, you will first have to establish your spin bet. This is a fixed-paylin slot so there is no need to worry about selecting paylines as you just have to decide on the coin values that you will be placing. When all is said and done, you can bet in increments of between 0.20 and 200.00 for each spin that you take. 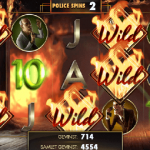 That wild symbol is three symbols high which really allows for some multiple wins to be had on your spins. However, isn’t it annoying when these large symbols only appear partially on the reels? Well, in Secrets of Atlantis, when that happens you will unlock nudge reels, a feature that will nudge these symbols so that they take up the entire reel on your screen. This will obviously give you the full potential of these wild symbols each and every time that you see them on the reels. While the nudge wilds are extremely handy, it is the main game feature called the ‘Colossal Symbols Respins’ feature that you will want to unlock the most. You will notice that on the three middle reels, some of the symbols will have a much lighter background. If you manage to have all of those middle reels with this lighter background you will unlock this feature that could land you some excellent wins. Once you have unlocked it, those three reels will transform into one single random symbol that takes up the 3×4 section in the middle of the reels. You are then given one respins of the reels which will hopefully land you some good wins. Of course, if you have that same symbol anywhere on the outer symbols, you are going to be counting the credits as they fall into your account balance. If you are able to get those lighter backgrounds once again from the respin, you will get another. There is the potential for this round to carry on for a number of spins and that is where you are going to get the big payouts from. Just to give you anticipation of even more value from this bonus round, should the stacked wild symbol be the symbols that are created, it will nudge up or down so that it completely feels the three middle reels rather than just taking up 3×4 of them. There are a number of reasons why NetEnt are one of our favourite slot developers and we feel that Secrets of Atlantis showcases them all. They always produce slots with quality graphics but more importantly, the game features they create are always completely different to what you will find anywhere else. It is the Colossal Symbols bonus feature that really sells this game and when you see the sort of rewards that you can get once you have unlocked it, you will see why. Nudge wilds as well, is a great little feature that really adds to your potential of bringing in the credits. We cannot recommend this online slot high enough and suggest that any player that has not yet tried it out, to get to the online casinos now and do so. Even if you are not ready to risk any real money on this slot just now, at least give it a go in the free version so that you can see what it has to offer. You really have nothing to lose and will instantly become hooked to an online slot that we feel is one of the best around.